As a small business owner, you know the value of every dime. To grow the business you must pay close attention to every expense, even fees associated with a credit card processor. Unfortunately, accepting credit cards means dealing with processing fees. However, to take your company to the next level, credit card processing must be part of normal operations. After all, for your customers to make an online purchase, they need a viable means of paying with a credit card. Typically, credit card processing companies charge as much as 5 percent on everything earned from credit card sales, including interchange costs, processing costs, and even statement fees. Because most people pay with plastic rather than cash, you need to accept credit cards in order to survive and succeed. According to the latest statistics, by 2017 only 23 percent of all point-of-sale (POS) purchases will be made with cash. At the same time, a 33-percent increase in credit card use is anticipated. Although unavoidable, you do have options for reducing fees. You also need to choose a reputable company like Chosen Payments. In addition to saving on processing fees, you gain access to other critical services such as online reporting, mobile applications marketing, ecommerce integration, and more. While it might seem as if leasing a credit card terminal is cost-efficient, in reality you will spend up to 20 times more than if you purchased a machine outright. The other issue is that leasing comes with a long-term contract that cannot be cancelled. The average cost of leasing a machine is between $40 and $70 per month, whereas the purchase of a terminal is anywhere from $200 to $400, depending on what you need. A much better solution for credit card processing, from a financial perspective, is to purchase a terminal. When you avoid entering transactions manually, the fees for credit card processing decrease. Although there will be times when manual transactions are necessary, you want to avoid them whenever possible. The reason is that entering transactions manually puts you at greater risk for fraud, so as protection the credit card processing company will charge a fee for every incident. 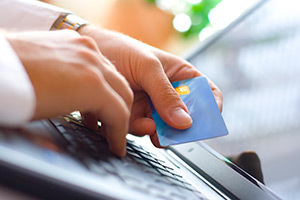 Especially if your company handles smaller transactions, consider imposing a minimum for credit card sales. For instance, the profit margin on a $5 or less transaction is only 10 percent. After paying applicable fees, you make virtually nothing. If you impose a minimum sale of $10 to $20, fees are paid you make a profit.